After three years of treating phragmites in Rondeau Provincial Park, Long Point Bay nearshore, Crown Marsh, Turkey Point Marsh plus adjacent areas, the results are very encouraging. Only small pockets of phragmites remain, as well as some re-growth where it was missed. Any areas treated will require “mop-up” work. Norfolk County is on board and is eradicating phragmites in the ditches along public roads. The Nature Conservancy of Canada is the operational lead for this work, in partnership with the MNRF who acquire the necessary approvals from Health Canada. Large, dense stands of phragmites are being sprayed by helicopter, from the MarshMaster amphibious vehicle, or from a Jon boat. Mop-up spraying is also done by the MarshMaster or, by foot, with people carrying backpacks of the herbicide and spraying by hand. The helicopter flies slowly at a maximum height of over the phragmites. Spraying by air is only possible on days with no or very light wind; and the spray nozzle is adjusted to produce small droplets, not a fine mist, to prevent drifting into areas not to be treated. The MarshMaster is very lightweight. If it happens to move over a reptile in its path, the reptile only gets pressed into the soft substrate unharmed. Operator and exterminator on upper deck of MarshMaster are constantly scanning for wildlife and take steps to avoid such travelling in dense Phragmites stands as much as possible. Phragmites is a grass which was introduced from Europe. It spreads rapidly by the large number of seeds it produces, long rhizomes and even last year’s fallen growth, which can grow new mother plants out of all nodes along the stalk. Further spreading of this invasive plant is mostly due to human activities, both recreational and construction. Government approvals, both federal and provincial, are required before any spraying over wetlands can be done. The glyphosate (Roundup Custom) herbicide is surfactant-less and needs to be imported to Canada from the USA and have an aquatic-safe surfactant added from Canadian chemical manufacturer. The 2018 Treatment season was a resounding success. 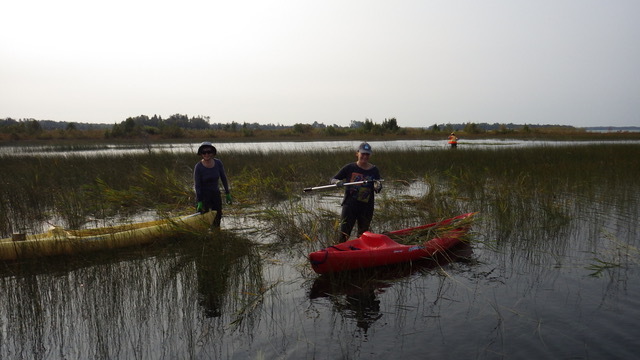 The primary focus was to search through areas treated with herbicide in the previous two seasons and target any Phragmites re-growth that may have returned. We know from experience that most often Phragmites is not fully controlled in one treatment season. This work was primarily accomplished through the use of NCC’s MarshMaster and a contracted MarshMaster owned by Eric Giles of Giles Restoration Services Inc. As you can imagine, the scale and size of areas covered was significant and this work took a lot of long days to accomplish. While the work was slow to complete, the good news is that most areas showed very little Phragmites re-growth and as a result a greatly reduced volume of herbicide was applied this year. See an example map of treatment and coverage at Turkey Point. 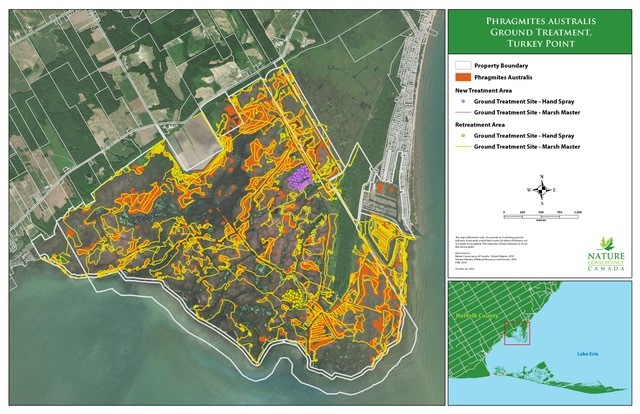 Map showing Phragmites ground treatment locations in Turkey Point. There were a few new sites treated as part of the program this year to close in gaps from previous years and ensure as landscape-scale of an impact as possible. In 2018 the remaining private wetlands in lower Big Creek near Port Royal were treated as well as the last coastal wetland in the Turkey Point complex. Aerial work using a helicopter was a small portion of these new treatment areas in 2018, accounting for about 10 ha in lower Big Creek, 14 ha at Long Point Company and 3 ha at the Crown Marsh. The remaining new areas in Turkey Point, including Ordnance Beach, were treated from the ground using the MarshMasters. We will be working with the Long Point World Biosphere Reserve Foundation to significantly update the project information on our website and will upload the rest of the 2018 project maps and a detailed summary as well as future plans to that website over the coming months. As part of a good IPM program several steps are often required to achieve control of a pest. With the Phragmites control program as a follow-up to the herbicide treatment, larger stands are cut, rolled and/or prescribed burn during the winter months. This work has begun in the coastal wetlands at lower Big Creek, Turkey Point and Long Point. and will continue rolling and cutting until hard freeze up arrives and start again when thaw occurs in late winter. The window to do this work is very small with the ice limitations and the need to work after turtles begin overwintering and before spring emergence along with the return of migratory birds. We anticipate some prescribed burns to occur in the meantime if mother nature works with us and limits snow cover. NCC has been very fortunate to receive funding from Environment and Climate Change Canada’s CWS Ontario (CWS) department to support a number of Phragmites-related activities this winter. Recognizing the need to support the important on-the-ground work as well as planning requirements to move the control program forward and inland, CWS has provided funding to promote Phragmites rolling, cutting and burning this winter in the Long Point area as well as much-needed NCC staff time to develop an implementation plan for Phragmites control in the Big Creek watershed. NCC has agreed to match these funds dollar for dollar and the result will be a plan that prioritizes, maps and outlines how to eradicate upstream seed sources that may re-infest our treated coastal wetlands, approximately 60 ha of created/restored wetlands in the lower Big Creek watershed, Phragmites cut and rolled using mechanical and manual methods across the Long Point region and a number of prescribed burns. This important funding will lay the cornerstone for moving this program to the next phase and position us well to deliver control inland in 2019. NCC greatly appreciates this partnership with CWS and looks forward to another successful Phrag-fighting season. Updates on the winter activities including plan development will be forthcoming. Through this partnership, NCC has brought Karen Alexander to Norfolk part-time to help prepare the watershed implementation plan. Karen has been working with NCC in our Windsor office for most of 2018 and brings with her a wealth of knowledge and experience in Phragmites management from her previous role at the Great Lakes Phragmites Collaborative in Michigan. Karen is establishing a working group to help her develop the implementation plan which will consider all aspects of trying to control Phragmites in the inland agricultural landscape.